Canederli are bread dumplings only found in the north-east of Italy (Trentino-Alto Adige, Friuli, and part of Veneto), where they are served as a first course or as a main entree. Variations of this dish are common in all south-eastern Europe, where they are also served as an accompaniment to meat stews and roasts. 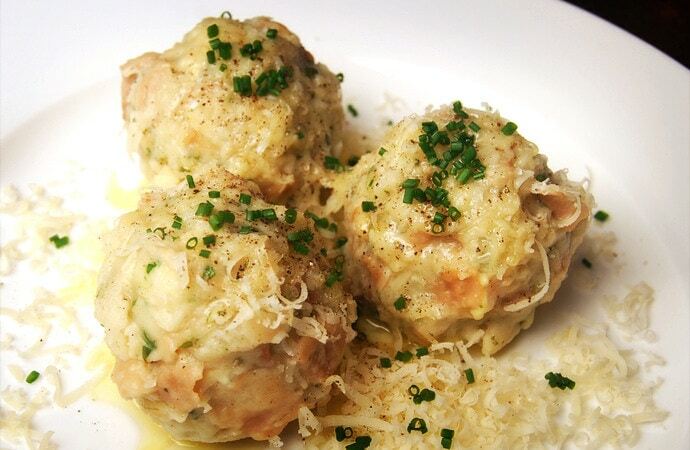 The word ‘canederli’, in fact, derives from the German and Austrian ‘knödel’ (dumplings). Canederli can be considered part of ‘cucina povera’ (cuisine of the poor), as they are made of simple and inexpensive ingredients: stale bread moistened with milk and bound with eggs and a small amount of flour. However, the mixture is often enriched with cheese and Speck (a kind of smoked prosciutto also typical of the north-east regions). There are several variations of this regional dish, the following recipe describes one of the most common: filled with cheese. Once the dumplings are prepared and boiled, they are either served “dry” with melted butter or in broth. Never miss a post! Subscribe to Disgraces on the Menu via email. Powered by FeedBurner. Put the stale bread into a large mixing bowl (1). Add the milk (2), the eggs (3), as well as salt, pepper and nutmeg. Mix well and let it rest for at least two hours, covered with a tea towel, in a cool place or in the fridge. Stir occasionally to ensure that the mix absorbs the liquid uniformly. After the two hours, add the flour (4), then the parsley (5), and the cheese (6). Mix gently. Finely chop the onion (7) and fry it in oil and butter for ten minutes at medium heat, stirring occasionally. Let the onion cool (8), then incorporate it into the mix (9). Let the mixture rest for another half-hour covered with a tea towel. It should look uniformly moist and slightly sticky. Using your hands, form the canederli by pressing together enough of the mix to make balls the size of a small orange (60 to 80 grams each). You should be able produce 14-16 balls out of the entire mix. After making each ball, roll it in flour to seal the outside and prevent the canederli from sticking to each other (10). When all the canederli are ready, re-roll them into flour and compress them a second time (11). Have the vegetable stock in a large pot, well boiling on the stove. Place the canederli gently in the pot (12-13), wait until the boil is resumed (14). Boil the canederli for 12-15 minutes (they will be floating the whole time), then drain them gently. If serving the canederli "dry", warm up the butter just enough to melt it. Place 3 canederli into each plate, pour the melted butter on them, then sprinkle with some thin-sliced chives, a generous amount of grated Parmigiano, and some freshly ground black pepper. If serving the canederli in broth, prepare more vegetable stock (as the one used for boiling will be cloudy because of the flour). 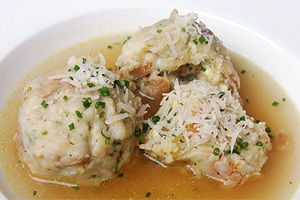 Place one or two canederli into each bowl, then pour the broth on them. Finish with some grated Parmigiano and (optional) chives. Note: once boiled, the canederli can be stored in the fridge for up to 3 days, or in the freezer for up to 2 weeks. These look great. I absolutely love dumplings but don't make them often. I'm feeling inspired now 😀 Buzzed! I tried making those repeatedly with no success…. will try your recipe as yours look perfect! 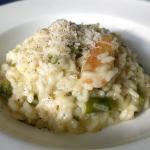 Thanks Janet and Pola, this dish is a bit of a process to make, but it's very reliable and absolutely a guest pleaser! We love your Canederli! Now that you posted the recipe I'll try to make them as well! Are you kidding? those look PHENOMENAL! You get a buzz AND a tweet! I grew up on Germany, and I had no idea Italy had knoedel, too! 🙂 These look a lot like Semmelknoedel, which are bread-based, not potato, like regular knoedel. One of my favorites! Great post, thank you for sharing! 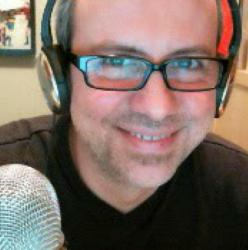 Wow, hese look and sound just fabulous and I would love to try them both ways. Congrats! Nutmeg is on the ingredient list but I cannot find in the recipe when to add it. @kdoltz, thanks for pointing this out! it can be added along with salt and pepper. I just edited the post. Thanks Marta, Missy, Kiri, Suzi and kdoltz – much appreciated. Kiri, special thanks for the feedback on German knoedel – I very much would like to try some potato knoedel! Very true, Simona. It's interesting also that we now buy fresh bread and intentionally make it go stale to prepare these dishes 🙂 We're so spoiled! Could you please post the recipe in U.S. measurements. This really sounds good and I would love to make it. Beautiful!! Love this and would love to try making them. I love everything Italian (well, at least if its vegetarian!). Great to "meet" you and excited to have found your blog! Sure Kathy, I will add the conversions shortly. This sounds so good! Please do convert the ingredients to U.S. Thanks so much for sharing this recipe! What a gorgeous recipe. I have tried several types of dumplings and only some times succeeded. 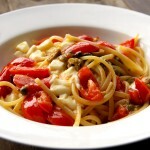 Your recipe is very straight forward and easy to follow and looks very delicious. Thanks for sharing such a wonderful recipe. I adored this sort of thing in Vienna, and I can definitely see the influence. Fabulous recipe, and congrats (belated) on a well deserved Top 9! Thanks everyone for your comments! I've added the conversions to U.S. measurements. What a great way to use old bread! These look absolutely wonderful! The best dumplings I've ever seen! Looks great! I just made a much plainer Slovenian version to serve with goulash. Think I might prefer yours. I think I see where I had a problem with my recent attempt at bread dumplings. Bread not dry enough. (Day old but not stale.) Looks delicious! I read about this recipe yesterday, today I cooked it and absolutely loved it! Very tasty and satisfying. I come from the italian alps ( alto adige) where they serve canederli all the time. 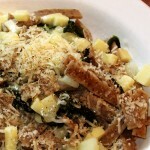 We also make a spinach version with or without cheese often eaten in a blue cheese sauce. they are called Spinatkoendel with gorgonzola sauce. i can post the recipe if anybody is interested! Hi there! Thanks for your comment. I love Alto Adige, it's probably my favorite place in the world, actually – especially the Funes valley (VillnÃ¶ss). 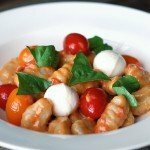 Yes, please do – Spinatknoedel sounds amazing! 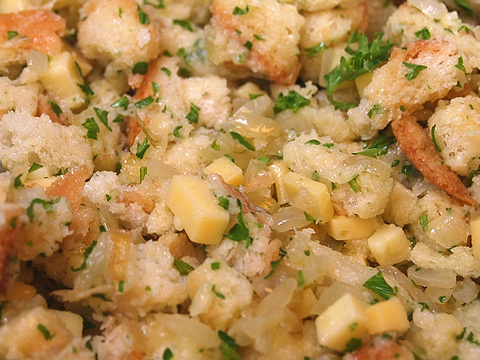 I made this recipe last night, and it brought back memories of the 2 times I ate this. One of the places I had it was the Hotel St. Sebastian in Bersone. 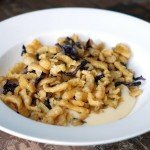 I made a Porcini mushroom sauce to accompany them, and they were a huge hit- thank you for the recipe! Thanks Merry for your comment! I'll have to try canederli with mushroom sauce, believe it or not I never have! I was in Trentino for some cycling and luckily paid for full board. I was served canerdeli as a starter. They were not stuffed, made into two inch long rolls a bit more than 1/2 an inch thick, served in a little broth (which was actually mainly butter) with a hint of parmesan. In the mountains this is normally winter food, but because of tourism happily some of these dishes are served in the summer. It would be hard to find such a simple dish that tastes so good. I had a couple of servings – the chef was happy to oblige because I was “doing Stelvio” the next day. Thank you, Laura, for your comment. Let me know how you will like them! I just returned from Alto Adige and I had the dumplings at the speck festival. I also have a beautiful piece of Speck Alto Adige in my frig. Now I have my weekend meal!!! 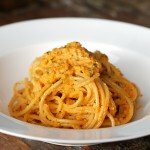 Previous Previous post: Pasta Calendar Quiz – The Results!